IHG Owners Association membership ensures your voice is heard and allows you to tap into unparalleled sources of information, ideas and tools to help grow your IHG hotel business. Being part of the Association gives you a voice with IHG, exceptional peer networking and engagement within the industry—all geared to help you maximize your investment. Get discounts and special offers on the items you need to run your hotel successfully, such as furnishings, fixtures, telecom equipment, linens and bedding. Our Allied Members are leading industry suppliers. View our current list of partners. As an Association member, you’ll receive a complimentary upgrade to IHG Rewards Club Platinum Elite status, which includes benefits like free internet, priority check-in and late check-out. Enjoy expedited service at more than 1,000 locations worldwide, plus benefits such as a car upgrade with each reservation (subject to availability), guaranteed discounts off best available rates worldwide for online and offline bookings and free one-way rentals. Manage removal of materials during renovation while making a positive difference in local communities through this Association/IHG partnership. Get the inside story on the Association, IHG and the industry through our member publications, including the quarterly OWNER magazine, bi-monthly myConnect online newsletter and more. Our partnership with HFTP gives our members additional resources and educational tools—as well as discounts—to enhance your business and increase the bottom line. Get complete details and how-to information about Association programs and benefits through an exclusive online video library. Make your voice heard by participating in Association Working Groups, comprised of owner volunteers who represent your interests to IHG on a wide variety of topics critical to your business. Working Groups include brand initiatives, standards, technology, procurement, IHG Rewards Club and many more. Share your experiences with other owners and learn from each other at our exclusive member events, such as special conference activities, regional owner meetings and owner summits. Share your feedback on the hottest topics via our Global Text Messaging Program. Your opinion matters, and results of these periodic surveys are shared with IHG to present owners’ views on critical subjects. Have a direct impact on your business by advocating for legislation favorable to the hospitality community. 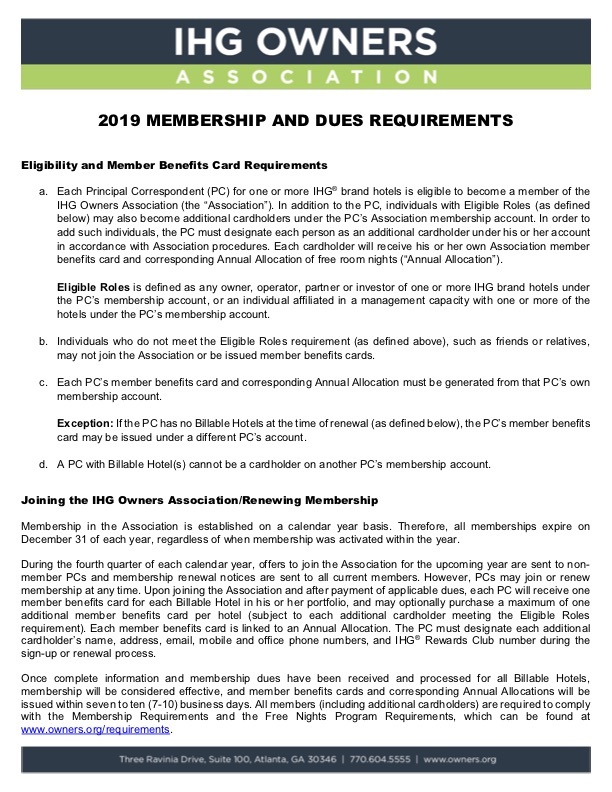 To learn more about membership features and benefits or to discuss your member account, please contact our membership team. 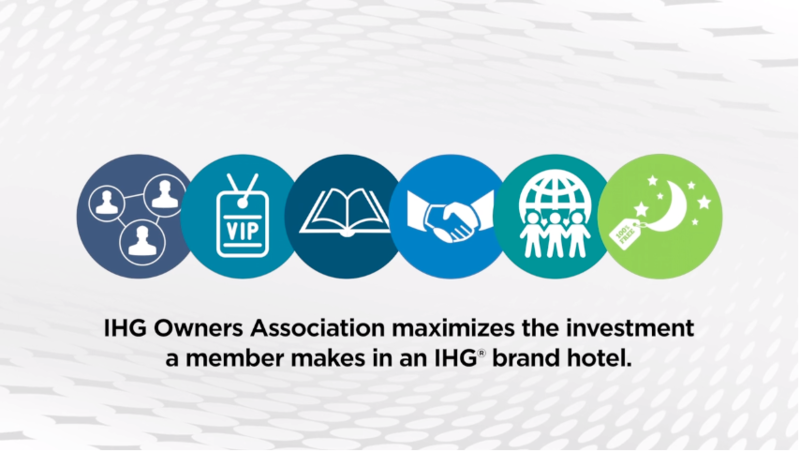 Membership in the IHG Owners Association can help increase returns, streamline productivity, energize strategies and position our owners for long-term success.